Salvador Dali The Siren of the Dream is a woodblock print. It is from the Divine Comedy book. It is Purgatory #19 and comes with its own Canto. There were 4765 French edition books printed. So that means there are many more than 4765 of this print. This is because some of the books have sets of extra prints. If you like the print, buy it. Don’t think it is an investment. A woodblock is exactly that. Cutting tools carve an image into a block of wood. The carving creates a relief pattern. That is the uncut part of the wood is printed. The Salvador Dali The Siren of the Dream print required 34 separate woodblocks to create the final woodblock. Printing one woodblock added the color wash laid on the woodblock. The entire printing process can been seen as a decomposition. I show an example of a decomposition of the main Divine Comedy page. 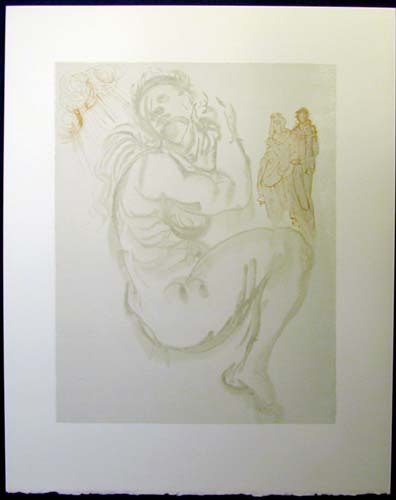 1) The individual woodblock, Salvador Dali Salvador Dali The Siren of the Dream, is available individually. If you desire we may have the print with a block signature. 2) The complete set of the Divine Comedy is Available. E-mail us for the Price and condition report. Subsequently, call us for more information. Finally, go to the main Dali Page for complete etching information.